Need a more individual approach to your workout? Hire one of our experienced Fitness Instructors to help you achieve your specific fitness goals. Pilates improves flexibility, builds strength and develops control and endurance in the entire body. It puts emphasis on alignment, breathing, developing a strong core, and improving coordination and balance. If you are looking for a workout with a low-impact on your joints this is a great class. This class is part of our Fitness Combo. Aerial Pilates originated from our Aerial Yoga class. It serves as an introduction to the Aerial Yoga. 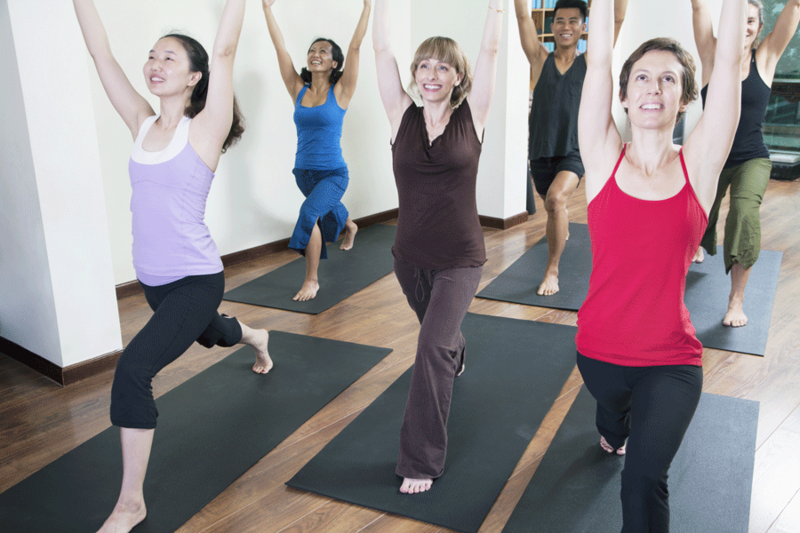 This class incorporates elements of Yoga, Pilates, and calisthenics. This class is accessible to different levels of fitness and ages and will focus on developing strength, flexibility and balance. A ballet (barre) inspired fitness workout designed to LIFT, strengthen, and sculpt the body. 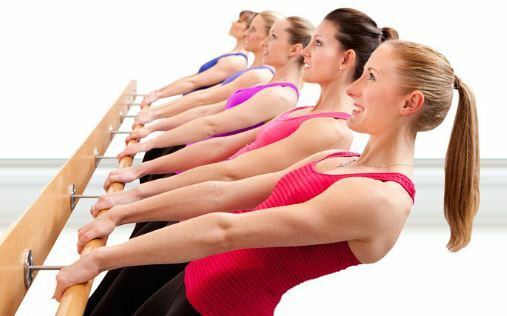 Barre Fitness incorporates elements of cardio, light weight training, Pilates, and yoga. Socks or ballet shoes will be needed during class. LIFT Yoga is a unique combination of traditional yoga poses and muscle strengthening, with a focus on biomechanics, core strength, posture, and breathing. 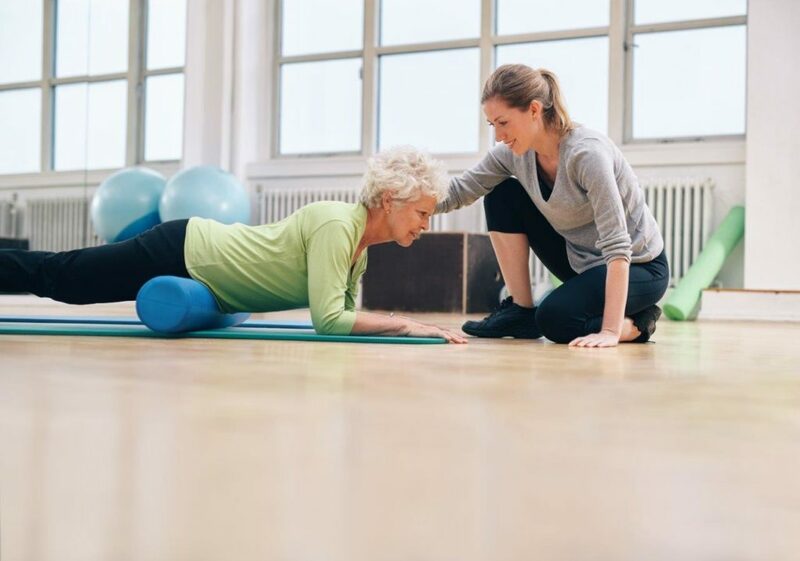 This class is offered with quiet music and a dimly lit setting to provide a more relaxing atmosphere to strengthen the body and release tension with exercise. 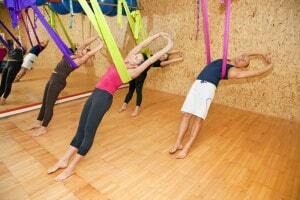 Aerial Yoga or Anti-Gravity Yoga will appeal to both genders and all ages. Anyone can take this class and do well on the first day; it is accessible to all body types and fitness levels. While specific poses and moves may vary from instructor to instructor, aerial yoga combines the basics of yoga with calisthenics, dance, Pilates and aerial acrobatics. Developed by dancer/choreographer Christopher Harrison, this technique allows you to enjoy the “Uplifting” benefits of yoga and dance along with the physical exercise, while having fun. You’ll be suspended from the ceiling from silk- like fabrics securely fastened to the ceiling apparatus to create a “hammock”. The hammocks are hung at various heights, allowing you to try different types of yoga and dance moves. The hammocks allow a greater range of motion and a deeper stretch than doing yoga or ballet stretches on the floor or ballet barre. KTEN News filmed a segment on our Aerial Yoga class — to get a good idea of what this class is all about, check out the video! You’ll be trained in safety practices and get accustomed to trust the aerial equipment. First we will be learning to become comfortable with the equipment that can actually support up to 2000 pounds. Once you overcome your initial fear, you’ll practice simple moves such as sitting and holding onto the fabric, followed by more advanced moves such as hanging upside down. *Full inversion positions in aerial yoga are not recommended for pregnant women, people with high blood pressure, or someone who has recently had eye surgery. Below the knee length or longer yoga pants. ¾ lengths or full length sleeves fitted shirt. No zippers, snaps, or jewelry (wedding band is okay), or anything that might snag on the fabric. As a courtesy please do not use perfumes, lotions, or oils before class. Try not to eat a big meal right before class. It might be difficult to do inversion poses after a big meal or drinking too much water. Play is one of the major principles of aerial yoga.